So Very Excited for Avon's Newest Fragrance: So Very Sofia! I found out, not too long ago, that AVON was teaming up with a new celebrity brand ambassador for a fragrance coming in campaign 21. We are currently in campaign 12, so I thought I would be waiting quite some time for someone to let us in on who the celebrity would be. Well, turns out I didn't have to wait as long as I thought! Today, AVON announced that they are partnering up with none other than Sofia Vergara for her fragrance "So Very Sofia"! The fragrance boasts a "playful blend of tropical passion fruit, exotic Flor de Mayo Orchid, and bright golden patchouli". As soon as I am able to, I will be ordering some for samples. You can sign up for the exclusive waiting list here. Be sure to watch this behind the scenes video with Sofia after you sign up! If you are looking for an AVON representative, you can shop with me online. If you live in Connecticut and would prefer meeting face to face, you can send me your contact information via the form on the right hand side of this blog! Avon Gift Baskets for Him and for Her! Yesterday I worked on some gift baskets for the upcoming Fire and Ice Gala celebrating the birthday of Building Broken Warriors Foundation founder Elijah Watson. These baskets will be raffled off to help raise funds for the Building Broken Warriors Foundation, which is a Connecticut based Non-Profit Organization centered on community development and togetherness. One of the great things about putting together baskets, is that you can create themes around them and personalize them to fit your needs. I make baskets for occasions year round including: Birthdays, Valentine's Day, Teacher Appreciation Day, Mother's Day, Father's Day, Christmas, and more. For great gifts and basket stuffers, visit my AVON e-store. If you'd like to order a pre-made gift basket, please use the contact form on the right hand side of this page. The past Saturday (May 7th) I was working as a vendor at an event that was raising funds for a Mom that has cancer. The turnout wasn't quite what we had hoped for (I think the rain kept many people away), but we did end up raising over $600 to help this mom offset some of her medical bills! 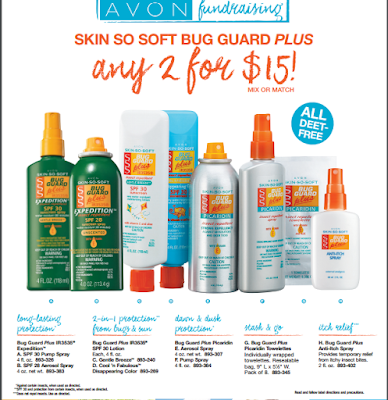 You are going to buy bug spray and sunscreen this year anyway, why not get it at a great price and help support a great cause? Payment will be $21 total (for any 2 Bug Guard items with taxes and shipping included) and payable via PayPal. The fundraiser starts today, 5/9/16 and ends Sunday 5/22/16. I don't know where I'd be without my Mom- she is one of the strongest people I know. She raised four girls on her own, has always been a support system, and even when I don't always show how much I appreciate her, I can always count on her to be my loudest cheerleader! This week has been a pretty busy one. Teacher appreciation week (we sent gifts in on Tuesday), Star Wars Day on the 4th (May the 4th Be With You) and now it's Cinco de Mayo! I was going to make a taco crescent ring on "Taco Tuesday", but we had plans and it didn't work out. We decided to push it off and make today "Taco Thursday" without realizing it was also Cinco de Mayo, and I have to tell you I'm kind of geeky excited about how well the "theme" is working out. Do you celebrate Cinco de Mayo? I'd love to hear all about your plans, so be sure to leave a comment! Also, don't forget to check out my e-store and get free shipping on any $25 order! Love This Gif from Google's Home Page! Today is National Teacher Appreciation Day. We've been really blessed over the last 4 years with Drew's teachers and every year we try to make sure they know just how appreciated they are. I can't imagine teaching is an easy job. I've gone on field trips and have helped during field day activities and I always leave wondering how teachers do it every single day. Today, to show our appreciation, I sent Drew to school with a gift bag full of some of my personal favorite AVON products! Don't forget to wish the teacher(s) you know a Happy Teacher Appreciation Day!